My favorite Subject in School? Happiness, of course! to bring together teachers, parents, academics, students, schools, colleges, universities, charities, companies and governments to promote positive education. Our goals are to support collaboration, change education practice and reform government policy. The fulfillment of intellectual potential through the learning of the best that has been thought and known. The development of character strengths and well-being, which are intrinsically valuable and contribute to a variety of positive life outcomes. For quite a long time, Geelong Grammar School in Australia has been the hallmark of applied Positive Education. But more schools shall follow soon. Even in Germany – which typically does not pick up Positive Psychology topics that fast – has seen some Positive Education initiatives as early as 2007. We have a movement called Schulfach Glück (“School Subject Happiness”) which is backed by the “Fritz-Schubert-Institute”. They bring a positive curriculum especially to primary schools, helping teachers to teach topics to their classes such as joy and motivation, curiosity and courage, and mindfulness and respect. Applying a quasi-experimental pre-posttest design, we examined the effectiveness of a new teaching unit called school subject happiness. The investigation took place at two vocational schools that had established this subject in the school year 2010/11. Effects of one school year of instruction in the school subject happiness on students´ well-being, self-esteem, and self-efficacy are reported. In addition, a moderation effect of the personality traits emotional stability and extraversion was investigated. A total of 106 vocational school students who belonged either to the treatment or the control group participated in the study. At the beginning and at the end of the school year 2010/11, all students completed questionnaires. Beneficial effects were found for affective components of subjective well-being and self-esteem. Furthermore, the effects on self-esteem and cognitive components of well-being were moderated by emotional stability. Students who reported higher emotional stability benefited more from the new teaching unit. For self-efficacy no effect was found. The results are interpreted as partial effectiveness of the program. 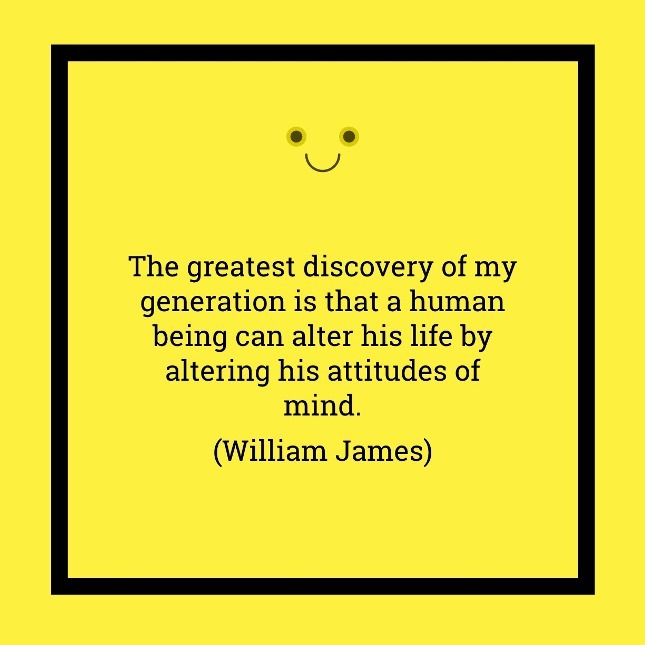 The greatest discovery of my generation is that a human being can alter his life by altering his attitudes of mind (William James). Now I guess, the Buddha discovered that a couple years earlier. But it´s still great to know that we´re not the slaves of our minds and feelings. …even if you don´t have one of those horribly expensive subscriptions to scientific data bases such as ScienceDirect or PsychINFO. follow researchers like Todd Kashdan who regularly publishes “popular science” articles on Psychology Today, or Robert Biswas-Diener who publishes articles via LinkedIn Pulse. visits researcher´s sites such as Marty Seligman´s www.authentichappiness.sas.upenn.edu. 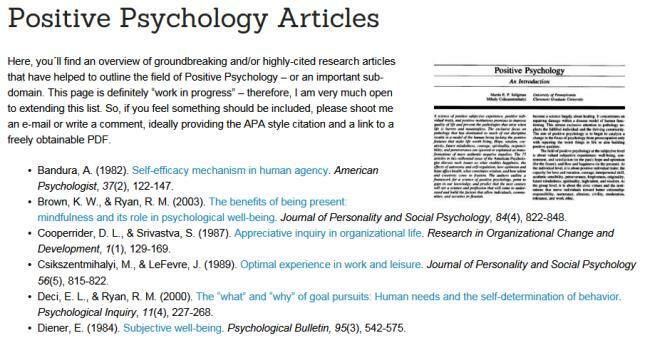 But if you are a little bit like me, you like to read an original research paper once in a while (here´s a collection of essential Positive Psychology papers), e.g., to do a fact-check, find additional articles, or just to get an in-depth perspective on a certain topic. Now, it can be a bit tough to get a hold of those papers since typically, they are hidden behind a database´s paywall. But then, the original publisher´s database is not the only way to obtain a certain paper. Here are seven alternative ways that don´t cost a cent. Nowadays, your first visit should always be Google Scholar. It indexes the sites of academic institutions but will also find a lot of research papers that are hosted somewhere else on the net. If you already know the paper´s name that you are looking for, just type that into the search field. But of course, you can also search for keywords, researchers, set a certain time frame, or limit your results to a certain branch of research etc. pp. If a free PDF is available, it´ll typically open up directly when clicking on the article in the search results. But oftentimes, there are different references for the same articles. It´s always helpful to click on the “versions” button below the search result – sometimes, the link to a PDF does not work, but then you can find another link that actually does work via that button. Another great feature is the button that letS you find “similar results”. If you have found an interesting article, clicking on that button will display papers that are very close to the one that you´ve found, e.g., because it´s from the same researchers, covers a similar topic, or cites a lot of the same references. Using this button cleverly will quickly deliver a decent overview of the really relevant papers for a certain research topic. Google Scholar also shows you how often a paper is cited by other articles. Without changing the settings, articles are typically (sort of) ranked in that order. Once again, this helps a lot to understand what are the really relevant papers and/or researchers in a specific field. Even though Google Scholar is pretty good at finding research PDFs on the net, it will not find all of them. I´ve obtained a lot of papers by using a valuable tool from the regular Google search. You can limit your search results to PDFs by typing “filetype:PDF” before your search terms (of course, this also works with .doc; .ppt etc.). This way works most effectively when you already know the full title of the paper that your are looking for. In that case, limit your search to PDFs and then copy/paste the title into the search bar in parentheses. If the article´s PDF is to be found somewhere on the internet, you´ll get it that way. For good reasons, most of the researchers will have a publication list on their websites. If there´s a free PDF on the internet, most of those researchers (those that have an interest in being read and cited) will set a link to the respective PDFs or host them on their own website. While it is typically not allowed to host a research paper that resides behind a database pay wall, there are often exceptions for the authors of those papers (at least, after a certain amount of time has passed after publication). Even if you do not find the exact same paper that you´re looking for, you may find earlier working papers or conference papers that are very similar to the article that you are actually looking for. There´s a (rather) new and very cool site by the name of ResearchGate. It´s something like a LinkedIn/Facebook for researchers – and a lot of articles are available via the participants´ profiles. So it´s a good idea to sign up. But typically, if a PDF is to be found there, Google Scholar will also reference it. Nowadays, you´ll find the e-mail address of the so-called “corresponding author” on the title page of every research paper (and in most cases, it´s also mentioned below the article’s abstract on the net). If there´s no way to get a free PDF via the WWW, you can just send an e-mail and politely ask for a copy of the paper. If the researcher in question is still active and has an interest in being read and published, there´s a good chance you´ll get a nice reply containing the PDF in no time. It´s always handy to know at least one professor, post-doc, or Ph.D. student. Even if they do not work in the specific field that you are interested in, there´s a good chance they can obtain a paper via their university´s database subscription – and e-mail it to you. Use this method sparingly as this group of people tends to work about 150 hours per week. *If you know additional ways of obtaining free research PDFs, please leave a comment below this article. 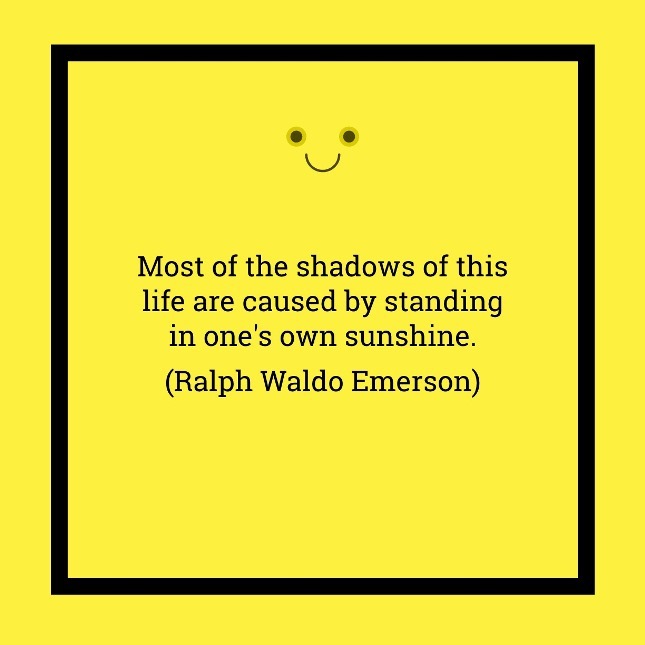 Most of the Shadows of this Life are caused by standing in one´s own Sunshine. A couple of weeks ago, I was musing about the notion that the German language may just not be the perfect vehicle for Positive Psychology – as I feel my mother tongue may lack specific positive words, or at least displays a certain lack of breadth and differentiation at the positive end of the “language scale”. While this “lost in translation” effect was based on my intuition and personal experience, recent research supports my notion at least to some extent. As part of a large-scale study, researchers collected the most frequently used words in all of the major languages of the world – and then had them rated for positivity/negativity by natives speakers. Each and every language is positively skewed. Means: across languages, positive words are used more often than negative words. Some languages are heavily inclined to the positive side (e.g, Spanish), while others are more balanced (e.g., Chinese). German is located in the lower middle part, so we use positive words less often than a lot of other languages (including English). I think this study is able to shed some light on why someone might feel the aforementioned “lost in translation” effect when trying to bring Positive Psychology to a culture other than the “typical” Anglo-Saxon context. It just might be a (slight) case of an emotional mismatch. 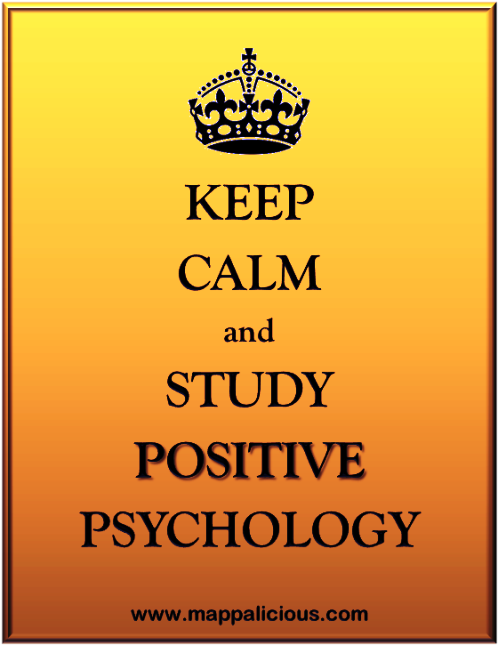 Luckily, the field of Positive Psychology is growing fast. Yet sometimes, it can be hard to stay up-to-date with all the latest studies coming out, books being published, articles and blog posts being written – and all the other exciting PP stuff that happens around the globe 24/7. 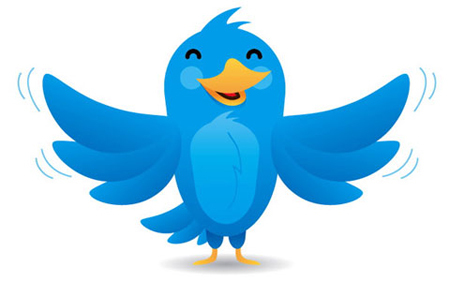 Below, you’ll find 10 social networking and news groups that you might want to join to be part of the ongoing conversation on all things Positive Psychology.